Mindy Dwyer is also the author and illustrator of Quilt of Dreams. Her artwork can be seen in numerous publications and in galleries across the United States. She lived in Alaska for many years. She now lives in Saugerties, NY. 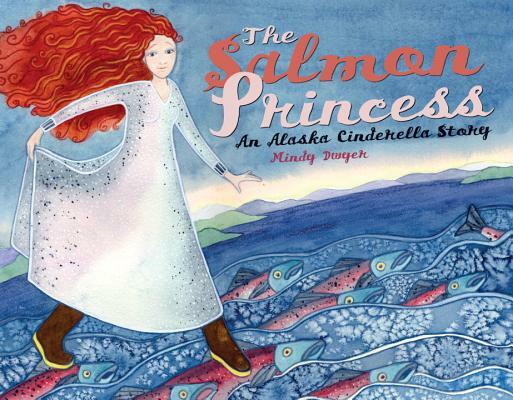 Mindy Dwyer recasts Cinderella into an Alaska fish camp in The Salmon Princess. We all know how it ends, but combining rubber boots with a silver gown for the Silver Salmon Festival makes for a sweet tale. This book has a great feeling about it, of wide open spaces and possibilities. The illustrations are just fanastic: Cinder's dress really is very salmonesque and the details of the Alaskan landscape, of giant trees and heavy fog are like a quick visit up north. The image of this gal in her silvery dress, firing up the skiff is a good one! And the illustration on page 15, of the "phosphorescent wake glowing like the train of a great wedding gown" glows with colors that break my heart. All illustrations are watercolors. The Salmon Princess, Dwyer's fourth book, marries Alaskan natural and cultural history to the Cinderella myth. It is rich with details of life in southeast Alaska, the fishing industry, salmon ecology and native traditions, and depicted in sweet and detailed watercolors.